Dr. V.K.Maheshwari, M.A (Socio, Phil) B.Sc. M. Ed, Ph.D.
Education is formation, recapitulation; retrospection and reconstruction. These are all continuous processes of education and only be provided with the help of experience. Different experiences are planned and adopted to educate and train the learners at different levels of education system. James Q Knowlton rightly suggested another important component which can be added for the process of instruction is” Experience”. Experience is the accumulation of knowledge or skill that results from direct participation in events or activities; the content of direct observation or participation in an event; something personally lived through or encountered. The practical wisdom gained from what one has observed, encountered, or undergone or felt. Experiences may be direct or indirect and of concrete and abstract. Edgar Dale (April 27, 1900 – March 8, 1985) was a U.S. educationist who developed the famous Cone of Experience. Dale was a professor of education at University. He made several contributions to audio and visual instruction, including a methodology for analyzing the content of motion pictures Edgar Dale, an expert in audiovisual education, created a model in his 1946 book Audio-Visual Methods in Teaching that he named the Cone of Experience to discuss various modalities/channels of imparting information. . The cone of experience given by Edgar dale has rightly said that it is not offered as a perfect or mechanically flaw less picture to be taken with absolute literalness in its simplified form. It is merely a visual aid to explain the interrelationships of various types of audiovisual materials, as well as their individual positions in learning process His cone did not refer to learning or retention at all, instead modelling levels of abstraction: words being the most abstract in his model, at the top of the cone, and real-life experiences the most concrete, and at the base of the cone. The cone of experience is a pictorial device use to explain the interrelationships of the various types of audio-visual media, as well as their individual “positions” in the learning process. The cone’s utility in selecting instructional resources and activities is as practical today as when Dale created it. 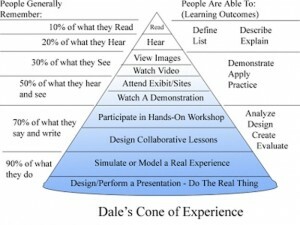 Dale’s Cone of Experience is a visual model that is composed of eleven (11) stages starting from concrete experiences at the bottom of the cone then it becomes more and more abstract as it reach the peak of the cone. Also, according to Dale, the arrangement in the cone is not based on its difficulty but rather based on abstraction and on the number of senses involved. The experiences in each stages can be mixed and are interrelated that fosters more meaningful learning. According to one of the principles in the selection and use of teaching strategies, the more senses that are involved in learning, the more and the better the learning will be but it does not mean that concrete experience is the only effective experience that educators should use in transferring knowledge to the learner. Like what was mentioned above, the experiences in each stages can be mixed and are interrelated thus, a balance must be achieved between concrete and abstract experiences in order to cater the and address all the need of the learner in all the domains of development and in order to help each learner in their holistic development. The generalization about the Cone of Experience that was presented above is not enough. Actually, we should try to go deeper in each of the component of the cone since Educational Technology basically revolves around the Cone of Experience. By going one-by-one, starting from concrete to abstract, we will understand more the different components of the cone that will help us in grasping the real meaning of educational technology. These are first hand experiences which serve as the foundation of learning. In this level, more senses are used in order to build up the knowledge. Also, in this level, the learner learned by doing things by him/herself. Learning happens through actual hands-on experiences. This level explains and proves one of the principles in the selection and use of teaching strategies, the more senses that are involved in learning, the more and the better the learning will be. This level also proves that educational technology is not limited to the modern gadgets and software that are commercially available nowadays. This shows that even the simple opportunity that you give to each child could help them learn. In this level, representative models and mock-ups of reality are being used in order to provide an experience that as close as reality. This level is very practical and it makes learning experience more accessible to the learner. In this stage, it provides more concrete experiences, even if not as concrete as direct experiences, that allows visualization that fosters better understanding of the concept. In this level, learners can participate in a reconstructed experiences that could give them better understanding of the event or of a concept. Through dramatized experiences, learners become more familiar with the concept as they emerge themselves to the “as-if” situation. It is a visualize explanation of important fact, idea, or process through the use of pictures, drawings, film and other types of media in order to facilitate clear and effective learning. In this level, things are shown based on how they are done. This level extends the learning experience through excursions and visits on the different places that are not available inside the classroom. Through this level, the learning experience will not be limited to the classroom setting but rather extended in a more complex environment. The level of study trips is followed by exhibits. It is a somewhat a combination of some of the first levels in the cone. Actually, exhibits are combination of several mock ups and models. Most of the time, exhibits are experiences that is “for your eyes” only but some exhibits includes sensory experiences which could be related to direct purposeful experiences. In this level, meanings ideas are presented to the learners in a more abstract manner. This experience allows student to see the meaning and relevance of things based on the different pictures and representations presented. The television and motion pictures etc. The last two levels would be the Visual symbolic and Verbal symbolic. These two levels are the most complex and abstract among all the components of the Cone of Experience. In the visual symbolic level, charts, maps, graphs, and diagrams are used for abstract representations. On the other hand, the verbal symbolic level does not involve visual representation or clues to their meanings. Mostly, the things involved in this level are words, ideas, principles, formula, and the likes. After going through the different components of the Cone of Experience, it could be said that in facilitating learning, we can use variety of materials and medium in order to maximize the learning experience. One medium is not enough so there’s nothing wrong with trying to combine several medium for as long as it could benefit the learners. Through the levels provided by the Cone of Experience, it could be said that concrete experiences must be provided first in order to support abstract learning. Lastly, staying on the concrete experiences is not even ideal because through providing abstract experiences to the learner, the more he will develop his higher order thinking skills which is important for more complex way of thinking and for dealing with more complex life situations. Through understanding each component of the Cone of Experience, it could be said that Educational Technology is not limited to the modern gadgets that we have right now but rather it is a broad concept that includes all the media that we can use to attain balance as we facilitate effective and meaningful learning. In Edgar Dale introduced the Cone of Experience demonstrate a progression from direct, first-hand experience to pictorial representation and on to purely abstract, symbolic expression. Enactive (direct experience),- Enactive or direct experience involves practicing with objects (the student actually ties a knot to learn knot-tying). Enactive experience involves concrete, immediate action and use of the senses and body. Iconic (pictorial experience) - Iconic experience involves interpreting images and drawings (the student looks at drawings, pictures or films to learn to tie knots). Iconic experience is once removed from the physical realm and limited to two or three senses. Symbolic (highly abstract experience)- Symbolic experience involves reading or hearing symbols (the student reads or hears the word “knot” and forms an image in the mind). In symbolic experience, action is removed nearly altogether and the experience is limited to thoughts and ideas. Conditioned- Conditioning refers to learning by pre-design or control via a series of punishments and rewards. Imitative – Imitation refers to learning tasks by observation or modeling. Trial and error – Trial and error refers to learning via a series of successful and unsuccessful trials and deliberations. Expansive learning - Refers to the questioning of the validity of tasks and problems of a given context to the transformation of the context itself. Although no experience is fully passive, iconic and symbolic experiences are generally more passive than direct experiences. Dale proposed that active and passive modes of participation can be contrasted by assigning a percentage of we tend to remember after two weeks after our experience. The Cone of Experience invokes a bi-directional movement from the concrete to abstract and from the abstract to concrete. Dale’s theory suggests that objects and the material culture of technology are mere augmentations or media to be used in the learning process. To fully empower teachers with a theory of practice in technology studies, technologies and physical settings have to play a more active role in cognition, emotion and action. When Dale researched learning and teaching methods he found that much of what we found to be true of direct and indirect (and of concrete and abstract) experience could be summarised in a pyramid or ‘pictorial device’ Dales called ‘the Cone of Experience’. In his book ‘Audio visual methods in teaching’ – 1957, he stated that the cone was not offered as a perfect or mechanically flawless picture to be taken absolutely literally. It was merely designed as a visual aid to help explain the interrelationships of the various types of audio-visual materials, as well as their individual ‘positions’ in the learning process. In true sense the bands of the (Edgar Dale’s) cone are not only the types of audiovisual materials but the different experiences are also included. In fact the upper four bands like verbal symbols, visual symbols, Radio, Recordings, and still pictures, and motion pictures are more related with Audiovisual materials but the later six bands of the cone like Exhibits, Field Trips, Demonstrations, Dramatic Participation, are the strategies of teaching-learning. Contrived Experiences and Direct, Purposeful Experiences are related with term Experiences .Each division represents a stage between two extremes-direct experience and pure abstraction. As we move from base of the cone to the up in order of decreasing directness. 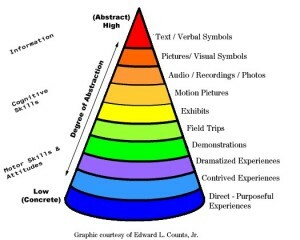 Similarly, if we move down from pinnacle of the cone in the order of the decreasing abstraction .Based on experience of teaching at different levels it was felt that, there are many experiences and audiovisual materials which are missing in dale’s cone and to be included by making a new model of experiences which is presented in the following Step Learning Experiences model. The base of the step learning experiences model is direct and purposeful experience which is always preferable for any new learner and any kind of learning concept and gives firsthand experience in turn leads to the permanent learning. At the top of the cone is verbal or text these are the least effective ways to introduce new content to students. The step learning experience model includes 17 different experiences. Verbal symbols are words, sentences, sounds, or other utterances that are said aloud in order to convey some meaning. The verbal symbol may be a word , an idea , concept , a scientific principle , a formula , a philosophic aphorism or any other representation of experience that has been classified in some verbal symbolism. It is also called Aroma Experience; Aroma is a quality that can be perceived by the olfactory sense. It is a type of Experience where the learner can have the concrete idea of the abstract thing through the sense of smell. Gustatory is an adjective that refers to tasting or the sense of taste, Gustatory has its roots in the Latin Gustare, meaning “to taste,” It is a type of Experience where the learner can have the concrete idea of the thing or object or concept through the sense of taste. We can have the taste of real thing which may be in different forms (different Size, shape, color).. It is a type of Experience where the learner can have the idea or the concept of the thing or object through the sense of touch and feel; it is learning through a hands-on approach and learners will be physically involved. Kinesthetic Learning Experience refers to one of the modalities that learners use in order to approach and absorb new information. Kinesthetic-tactile refers to a pupil who learns by movement and by touching. This type of experience can be given through hands-on activities, manipulating objects or flash cards, working problems or re-typing notes. Visual symbol may be a picture or shape that has a particular meaning or represents a particular process or idea. Something visible that by association or convention represents something else that is invisible; and something that represents or stands for something else, usually by association or used to represent something abstract. Visual experience has a rich predictive structure. This stage includes number of devices that might be classified roughly as “one dimensional aids” because they use only one sense organ that is either eye (seeing) or ear (hearing). All these materials are less direct than the audio-visual experiences. These can eliminate the unnecessary and unimportant material and concentrate upon only selected points. The important processes can be watched with slow motion and vital content and issues can be repeated number of times. The pupils are mere spectators and are distant from the experiences like touching, tasting, handling and feeling from directly experiencing. Television’s influence on language habits, vocabulary, consumer patterns, cultural values and behavior patterns should not be underestimated. Research suggests that even the learning pace can be enhanced or improved through television learning. The present day computers are not only compact, extremely powerful and versatile, commonly accessible and easy to use. The computer has, indeed become an integral part of our teaching process and daily life. Students then simulate the entire lab experience using the CAI, which saves time, resources. In education normally the arranged working models exhibited in a meaningful way. Sometimes they may be series of photographs or of photographs mixed with models and charts . The opportunity to handle the materials by the participant makes the way to use more sense organs and Learning by doing always helpful for meaningful or concrete learning. It is a trip by the students to gain firsthand knowledge away from the classroom as to a museum, factory, geological area, or environment of certain plants and animals. A field trip gives students a chance to study something in real environment, rather than in a classroom or laboratory. At field trips normally students see and note down certain important things. Sometimes they get chance to interview and discuss the things with officials or local people to clarify the doubts with supportive to observation. A demonstration is another means whereby pupils can see how certain things are done. Demonstration may require nothing more than observation on the part of the pupil or observer. It is the act of showing or making evident or circumstance of proving or being proved conclusively as by reasoning. It may be description or explanation of a process and illustrated by examples, specimens and it also includes the act of exhibiting the operation or use of a device, machine, process and product. There are many things we cannot possibly experience at first hand and we cannot experience directly something that has already happened. Furthermore some matters cannot be reduced to contrived experience and some ideas must of necessary be somewhat abstract and symbolic. Dramatic participation can help us get close as possible to certain realities that we cannot reach at first hand. As students re-create images, pictures, visual details, staging, movement, location and direction with drama their spatial learning skills are developed. Logical learning follows from using rational patterns, cause and effect relationships and other believable concepts involved with the drama. Sometimes music, or even the music of language, is also used in working with drama. Though the virtual experience can be called as contrived experience but the pupils level of experience may differ and the kind of joy and level of understanding may be high at virtual than the contrived experiences which include models mock ups and cut-away as we can consider them as hardware. A virtual learning experience involves a set of teaching and learning tools designed to enhance a student’s learning experience by including computers and the Internet in the learning process. The representation of the learning environment ranges from text-based interfaces to the most complex 3D graphical output. Smart boards are the best examples for virtual experience where students can conduct science experiments in simulated way. In virtual experience pupil can see and hear but not use the senses of touch and smell. We can bring reality in the classroom which is more than contrived experience and as near as the real experience. Four-Dimensional Experiences that describes a presentation system combining a Three Dimensional film with Physical effects in the theater, which occurs in synchronization with the film. Because physical effects can be expensive to install, 4-D films are usually presented only at special venues, such as theme parks and amusement parks. Due to the fast growth of technology, 3-D Theaters have been enhanced by the addition of special simulations.In Education some of the abstract concepts of literature, history and science can be taught with Four dimensional effects and pupil may enjoy the abstract content in a concrete way with same effect as it is given by the poets in the poems, even at science issues and concepts as if they are experiencing in a real situation. Ubiquitous means “pervasive, omnipresent, ever present, and everywhere”.A ubiquitous learning experience is any setting of the environment in which students can become totally immersed in the learning process. To define, it is a kind of experience where learning is happening all around the student but the student may not even be conscious of the learning process. The Ubiquitous learning Environment includes an ubiquitous computing technology-equipped system supplies users with timely information and relevant services by automatically sensing users’ various context data and smartly generating proper results. So the characteristics of a pervasive computing environment can be mainly concluded as the following: User mobility, Resource and location discovery, Context awareness (user/time/location), Collaborative interaction, Ambient information, Calm technology, Event notification, Adaptive interfaces, Invisibility object augmentation, and Any time/anywhere. These experiences can be observed live or in real time through technological gadgets and the same can be used effectively to the students understanding of the processes, certain special environments and sometimes the special actions too. Direct real experience can give greater experience in learning for the students than virtual or contrived experiences. The pupil will have an opportunity to observe and study directly. Hence its impact may be high on learning than the other earlier experiences. It is also an alternative experience to the direct purposeful experience. When teachers are unable to provide direct purposeful experience, they may only have the best option of direct real experience. Direct Purposeful Experience: The Base of the Step Learning Experiences Model represents direct reality itself as we experience it at first hand. It is the rich full bodied experience that is the base of education. It is the purposeful experience that is seen, handled, tasted, felt, touched, and smelled. It is the experience of life and we get it by living. Some of our richest, most vivid sense impressions are those which involve our feelings and perceptions in an eager exploration of the world. The cone of experience given by Edgar dale has rightly said that it is not offered as a perfect or mechanically flaw less picture to be taken with absolute literalness in its simplified form. It is merely a visual aid to explain the interrelationships of various types of audiovisual materials, as well as their individual positions in learning process. The Cone should be considered as a continuum rather than a hierarchy. Learning occurs through all of the experiences present in the Cone, and all experiences may be appropriate at different stages in the learning process or for different audiences. The Cone does not demonstrate which is the best method of learning? One can conclude that many different kinds of instruction should be used in the classroom. Since no single method is superior to another, instructors must analyze the audience as well as the content. Some content may fit into one teaching method, while other content may be better suited to another method. Mathematics is a subject of abstract concepts and can be learnt better through verbal and visual symbols, contrived and virtual experiences. It may not be possible to give direct experiences for pupil in subjects like mathematics and statistics.Verbal and visual experiences are suitable only for Language learning. Experiences are meant to experience not to evaluate or compare among them. Experiences are purely individualised, with the same kind of experience one’s perception may be differ from others. One can learn better than other, some pupil can learn better with the direct experiences and others can learn easily with virtual experience, some through contrived, one dimensional and two dimensional aids. John Dewey says that “Direct experience had the disadvantage of being limited in range and fatally restricted”(1946. P-51). Indeed, we learn many things indirectly even better than the direct experience. The direct experience is not necessary or suitable for learning all kinds of concepts. James P. Lalley and Robert H. Miller have examined many different studies about learning and retention and have concluded that the most learning and retention occurs when many different teaching methods are used in the classroom. They found that direct instruction, or lecture, is most commonly used in the classroom and has “a significant effect on retention”. Reading, although it appears to have little value based on Dale’s Cone will influence the students’ ability to learn throughout their lives. When Dale researched learning and teaching methods he found that much of what we found to be true of direct and indirect (and of concrete and abstract) experience could be summarized in a pyramid or ‘pictorial device’. He stated that the cone was not offered as a perfect or mechanically flawless picture to be taken absolutely literally. It was merely designed as a visual aid to help explain the interrelationships of the various types of audio-visual materials, as well as their individual ‘positions’ in the learning process. In order for students to develop meaningful knowledge, feelings and skills, their direct experiences must be “associated with abstractions,” as Dale noted. Language and expression are essential to skill acquisition. Many distinguished authors have gutted the pyramid’s claims. Educational expert Daniel Willingham was against the pyramid related to oversimplification; providing an optimal learning experience does not boil down to the instruction method. There are many different variables that impact learning. In her book Char Booth explains another danger of the pyramid, that relying too heavily on the idea of mode strips away designing instruction for differences in context and content . Booth’s anecdote about how she embraced the pyramid because of its implications for student engagement illustrates another flaw with it. The pyramid is a visual sighting. If we only remember 30% of what we see, then a picture of the pyramid should not have such a dramatic memory impact on so many people. Looking at Dale’s cone of Experience, one can realize that there can be numbers of model that can be used by the teacher to reach the learner depending on the learners need. Despite the pyramid having been debunked in many venues for decades, it continues to show up in educational presentations and literature. Dale Edgar. (1954). Audio-visual methods in Teaching. (2nd ed).New York: The Dryden Press. Dale, Edgar.(1946). Audio-visual methods in Teaching. New York: The Dryden Press. Dale Edgar. (1969). Audio-visual methods in Teaching. (3rd ed).New York: The Dryden Press. Dewey. John. (1916). Democracy and education: an introduction to the philosophy of education. New York: The Macmillan Company. Dewey, John. (1998) Experience and Education: The 60th Anniversary Edition . Kappa Delta Pi: West Lafayette IN. Lalley, James P. & Robert H. Miller. (2007). 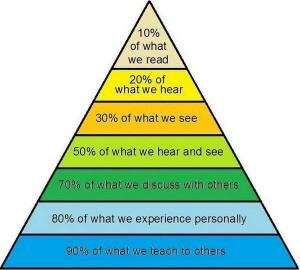 The Learning Pyramid: Does It Point Teachers in the Right Direction?. Education 128, No. 1: 64-79.